Autism puzzle ring: Silver Puzzle Pieces Create A Stretch Ring That's Perfect To Raise Funds For Autism Awareness & Research or show your support for someone with autism! 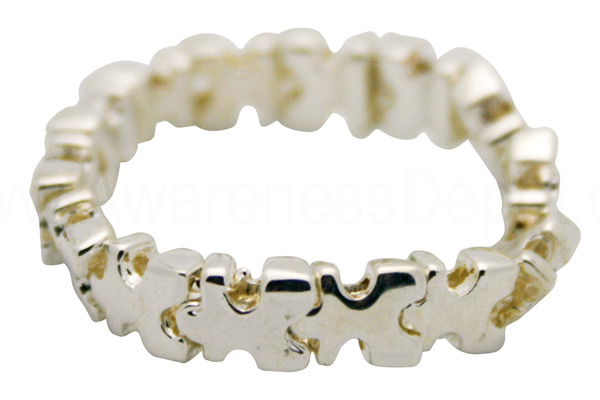 This silver-tone stretch puzzle ring is the perfect way to show your support for Autism Awareness! Comfortable stretch band will fit approximately sizes 6-9. Stretch rings make the perfect present! Puzzle ring band measures 1/8 an inch wide. Stretches to fit most fingers. To send check or money order, please send to: Americas & Americas, 13414 S.W. 128th St. Miami, FL 33186. To fax in a purchase order, the number is 305-253-0606. Must be on company letter head..
home | about us | shipping info | send email | site map | view cartCopyright © 1996-2019 AutismThings.com All Rights Reserved.